You love cooking? You also have children? Maybe you belong to the group of women who don’t really love cooking but it’s a chore that they can’t avoid daily? Why don’t you try to make cooking a fun and bonding activity with your children once or twice a week? 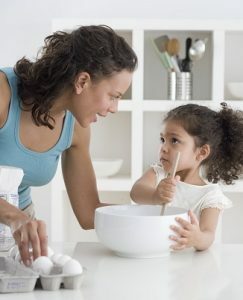 You will be surprised how beneficial cooking is for small children even from the tender age of four! Fine motor skills: such as kneading and stirring. Mathematical perception: ‘How many eggs did we use for the cake? Lets count them together.’ You can also repeat the sequence of the materials you are using. Sense of time development: ‘How long will we leave the cake in the oven?‘ You can practice telling the time together and playfully count the time on a big clock, learning minutes and hours. Sense of smell: ‘How does cinnamon smell like?‘ ‘ Try smelling a few distinctive ingredients together and learn their aroma, this will be a good way to motivate recognition of different foods and development of this very important sense. Touch: ‘Is the dough sticky? Let’s see how that feels like.‘ You can teach your children that some ingredients come in a liquid form while some others are solid. Vision training: ‘Has the butter melted?’ ‘Has the cake risen?’ Ask your child to describe what she is seeing and what kind of visual cues we are looking for in each ingredient we are using. Sense of taste: Make a game out of testing different kind of flavors and ask your children to describe how each taste feels like. If you have older children, even from the age of five, you can emphasize the portions you are using. Prompt them to pay attention to quantities and measurements such as how much is a cup of oil, three quarters of sugar or a spoonful of salt. Cooking with your children can be educational and a lot of fun at the same time; try it out and experience some unique bonding moments with your little treasures! Enjoy!